Animal Farm is a short novel by George Orwell. It was written during World War II and published in 1945. It is about a group of farm animals who rebel against their farmer. They hope to create a place where the animals can be equal, free, and happy. In the end, however, they are betrayed and the farm ends up as bad it was before. Although rejected by several publishers, when published it became a best-seller. 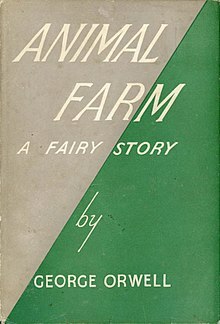 Animal Farm is one of Orwell's two best-known books (the other is Nineteen Eighty-Four) and is widely viewed as a classic. Time magazine chose the book as one of the 100 best English-language novels (1923 to 2005). it also featured at number 31 on the Modern Library List of Best 20th-Century Novels. It won a Retrospective Hugo Award in 1996, and is included in the Great Books of the Western World selection. Manor Farm is run by Mr Jones, a cruel and drunken farmer. One day, the animals gather at a meeting to listen to Old Major, a wise old pig. Old Major makes a speech, calling for animals to rise up against their farmers. The animals are very keen about the idea. Old Major dies a few days later. The pigs, who are the most intelligent animals, begin planning a rebellion. They are led by Snowball and Napoleon. About three months later, the animals revolt against Mr Jones and take over the farm. They change its name to "Animal Farm". They decide the farm will now be ruled only by animals, calling the system "animalism". They write seven commandments, with the most important being "All animals are equal". “Four legs good, two legs bad” becomes a popular chant for the sheep. Mr Jones and his friends attack the farm to try to take it back, but in the "Battle of the Cowshed" the animals drive them away. Mr Jones flees and never returns. Snowball and Napoleon fall out with each other, as they have different ideas for how Animal Farm should be led. Snowball announces plans to build a windmill, but Napoleon disagrees. Napoleon trains nine puppies, who grow into vicious dogs who will serve him. When the dogs are fully grown, he uses them to chase Snowball off the farm. He takes control and rules the farm by himself (as a dictator). Napoleon uses the dogs to kill any animal that does not agree with him, while a pig called Squealer keeps telling the animals that everything is fine and they should support Napoleon. Napoleon changes his mind and decides to build a windmill, pretending that it was his idea all along. The first windmill they build collapses. Napoleon blames this (and other problems) on Snowball. He claims that Snowball is sneaking around Animal Farm ruining everything. Many animals are killed for "being in contact with Snowball". Napoleon starts working with human beings outside, even though this used to be forbidden. One of them is their neighbour, a farmer called Mr Frederick. He brings in a group of men who invade the farm and destroy the second windmill. The animals fight them off in the "Battle of the Windmill", at great cost. As the animals build a third windmill, Boxer, their strongest horse, loses his strength because of old age and collapses. Napoleon sends him to be slaughtered, even though Boxer was his friend. The pigs continue to work with humans and start to behave like them, such as living in the farmhouse and walking on two legs. They teach the sheep a new chant: “Four legs good, two legs better”. The commandments are replaced by the words "All animals are equal, but some animals are more equal than others." In the end, other animals watch the pigs talking with a group of humans and decide they cannot tell which is which. George Orwell who was a socialist and was opposed to dictatorship (rule by one person). In particular, he did not like the communist government of Joseph Stalin in the Soviet Union. In 1936 and 1937, Orwell fought in the Spanish Civil War. He had watched as democratic left-wing rebels were pushed out by pro-Soviet communist rebels. In the introduction to the 1947 Ukrainian translation of Animal Farm, Orwell said he wrote it because he wished to destroy what he called the "Soviet myth". Orwell also said he said he got the idea from seeing a young boy whipping a large cart horse. He explained, "It struck me that if only such animals became aware of (knew) their strength we should have no power over them, and that men exploit (badly use) animals in much the same way as the rich exploit the proletariat (the poor, the lower class)". There are many characters in the book who are based on real people. They are grouped into pigs, horses, humans and other animals. Old Major – An old prize-winning pig. He is the one who inspires all the animals to rebel against the humans. The character is based on Karl Marx and Vladimir Lenin, the communist leader of the Russian Revolution. Napoleon – A large boar (male pig) who at first leads the revolution with Snowball, then grabs power for himself. He is the main villain of the story. The character is based on Joseph Stalin. He is named after Napoleon, who overthrew the government of the French Revolution. Snowball – He is the pig who is one of the early leaders of the revolution. He is popular among the other animals and wants to make Animal Farm a fair place for them to live. He is mainly based on Leon Trotsky, although Orwell said he was not a supporter of Trotsky. He also has some characteristics taken from Lenin. Napoleon later blames anything that goes wrong on Snowball. Squealer – He serves as Napoleon's public speaker. He persuades the other animals to support Napoleon, no matter how bad his rule is. He lies, twists the truth and takes advantage of the animals' bad memories. He represents "propaganda", which is news reports and art that is meant to get people supporting something. Minimus – A poet, who writes the second and third national anthems of Animal Farm, after "Beasts of England" is banned. He creates poems and songs praising Napoleon. Boxer – A loyal and dedicated cart-horse. He is the strongest worker among the animals. He is loyal to Napoleon, who later betrays him. He and his companion Clover represent the working class during the Russian Revolution. Clover – A motherly mare approaching middle age. She is Boxer's companion, and she takes care of him. Like Boxer, she works as a cart-horse on Manor Farm. During the book she has doubts about the pigs' behavior, but she instead assumes she is not remembering things properly. She realises later the situation but is not smart enough to express herself. She represents the educated working class. Mollie – A foolish, pretty and vain young white mare. She likes sugar so much that when eating of sugar is banned, she smuggles some into the farm. When it is discovered, she leaves for another farm. The character represents the Bourgeoisie (upper class) of the Russian Revolution, who were happy with their life under rule of Tsar Nicholas II and mostly fled the country after the revolution. Mr. Jones – The farmer of Manor Farm. The animals revolt against him because he does not feed them or take care of them, and he whips them. He is based on Tsar Nicholas II. Mr. Pilkington – The farmer of Foxwood, a large neighbouring farm. He and his farm represent the United States. He and Napoleon are seen arguing at the end of the story, which represents the start of the Cold War. Mr. Frederick – The owner of Pinchfield, a small but well-kept neighbouring farm. He briefly enters into an alliance with Napoleon, but cheats the animals and later invades them. He is a reference to Adolf Hitler. Benjamin – An old donkey. He is bad-tempered but very smart and a friend of the horses. He is thought to represent the older generation - wise enough to see through the pigs' lies, but not willing to stand up to them. Moses – An old raven who occasionally visits the farm. He tells the animals stories about a heavenly place above the clouds called Sugarcandy Mountain, where he says that all animals go when they die—but only if they work hard. Moses is thought to represent the Church (or religious community) in Russia at the time. Muriel – A wise old goat who is friends with all of the animals on the farm. Bluebell and Jessie – A mated pair of dogs. Their puppies are taken away from them by Napoleon at birth. The Sheep – The sheep are said to be the stupidest of the animals. They blindly follow Napoleon and chant slogans like "Four legs good, two legs bad." Sometimes, Napoleon gets the sheep chanting to stop people talking, a trick that Stalin sometimes used. The Hens – The hens are among the first to rebel against Napoleon. The Dogs – Napoleon raises nine puppies to be his bodyguards and secret police. They serve only Napoleon, and kill anyone who is against him. The Cows – Their milk is stolen by the pigs, who learn to milk them. It is stirred into the pigs' food every day while the other animals are not allowed to have any. The Cat – The cat never does any work, but she is forgiven because her excuses are so convincing. She has no interest in the politics of the farm. Animal-ism is a system of beliefs shared by the farm animals of Manor Farm. The purpose is to ensure the farm animals behave like actual animals and not follow the footsteps of humans beings. Therefore, any human behavior is considered contrary to the spirit of Animalism. "Beasts of England" is a song that is featured in the story. The tune as said to be "a cross between La Cucaracha and Oh, My Darling Clementine". Old Major teaches the song to the animals in an early scene, and it becomes very popular. It becomes the first national anthem of Animal Farm. Later on, Napoleon orders a new anthem to be written, with words that praise him. These are the original commandments laid down by the pigs. For the sheep, who are said to be stupid, they are instead taught the chant "Four legs good, two legs bad." Napoleon sometimes gets the sheep to chant this when he wants the animals to stop talking. As the story goes on, the pigs start changing the commandments. For example, "No animal shall drink alcohol" becomes "No animal shall drink alcohol to excess". By the end of the story, all the commandments have been erased apart from "All animals are equal", which has been changed to "All Animals are equal but some animals are more equal than others." Meanwhile, the sheep chant has been changed to "Four legs good, two legs better." ↑ "Literary Encyclopedia: Animal Farm". litencyc.com. Retrieved 3 September 2010. ↑ "Animal Farm (novel by Orwell) -- Britannica Online Encyclopedia". britannica.com. Retrieved 3 September 2010. ↑ "BBC - History - Historic Figures: George Orwell (1903 - 1950)". bbc.co.uk. Retrieved 3 September 2010. ↑ 5.0 5.1 "George Orwell: Preface to the Ukrainian Edition of 'Animal Farm: A Fairy Story'". orwell.ru. Retrieved 3 September 2010. ↑ "Preface to the Ukrainian Edition of Animal Farm - Written by George Orwell - Charles' George Orwell Links". netcharles.com. Retrieved 3 September 2010. ↑ "Ideas and Trends - Orwell's 2-Legged Message - NYTimes.com". query.nytimes.com. Retrieved 3 September 2010. ↑ 9.0 9.1 9.2 John Rodden, "Introduction", in: John Rodden (ed. ), Understanding Animal Farm, Westport/London (1999), p. 5f. ↑ "The Fall of Mister Jones and the Russian Revolution of 1917". Shmoop University. Retrieved May 13, 2013. ↑ "SparkNotes " Literature Study Guides " Animal Farm " Chapter VIII". SparkNotes LLC. Retrieved May 13, 2013. ↑ "The Scheming Frederick and how Hitler Broke the Non-Aggression Pact". Shmoop University. Retrieved May 13, 2013. "Animal Farm by George Orwell". Retrieved 2008-05-22. This page was last changed on 15 April 2019, at 14:56.